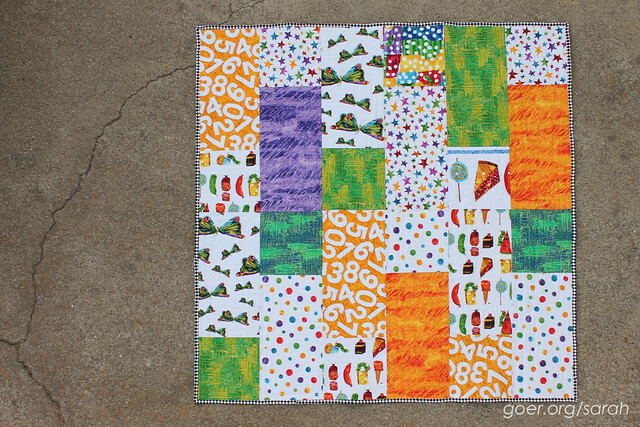 I have two more Very Hungry Caterpillar quilts to quilt and bind, but this one is done! It's even wrapped and ready to be gifted. 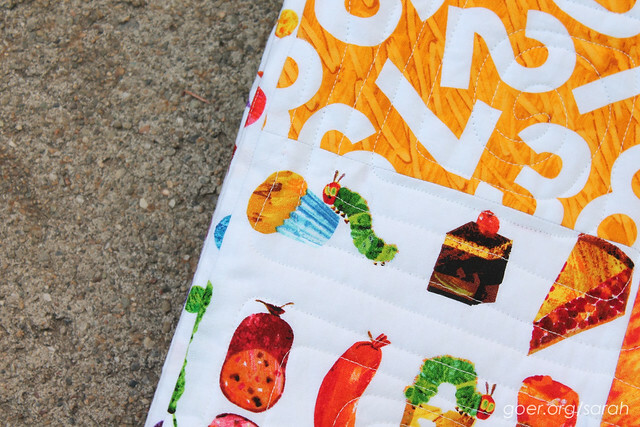 I've loved this fabric line since I first saw it before I had kids. I've used it numerous times. One of my current unfinished projects is a twin-sized quilt for my son. When I decided to make him a twin sized quilt, I was also at the point that I decided I was beginning to feel done with this fabric. (I've been using it over the past seven years.) 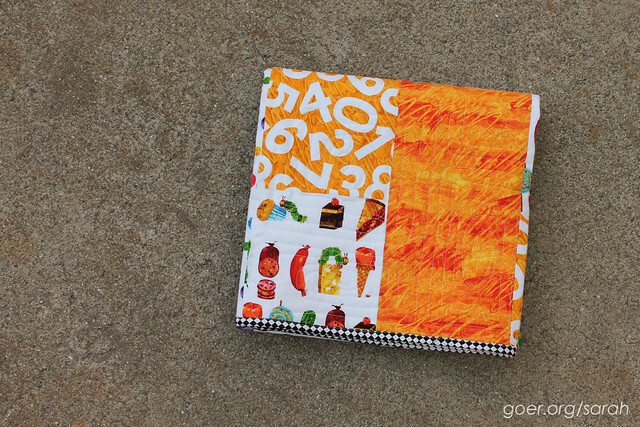 So while I was making Fat Quarter Fizz blocks (free pattern from Fat Quarter Shop) for his quilt, I just kept making more. I ended up having enough blocks for an additional small lap quilt and this baby quilt. I even made a doll sized quilt with the leftover pieces when I ran out of blocks. 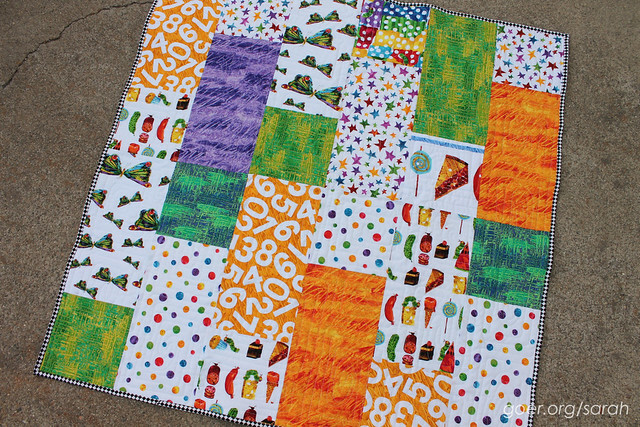 I'm not actually out of the fabric, but this made a very large dent in my Very Hungry Caterpillar fabric stash. 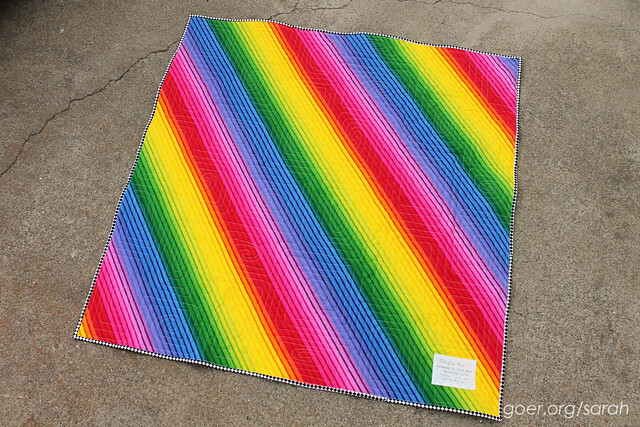 I backed the quilt with this wonderful rainbow fabric. I may love the back even more than the front. Since the front was very colorful and the back is a vibrant rainbow, I opted for a black an white (with a spec of red) fabric for the binding. I named it Caterpillar Fizz, a nod to the pattern name. Here's my simple label. I attach my labels before quilting, so they're extra held in place by the quilting stitches. This 36" x 36" quilt is going to a little 6-month-old and I hope he loves it to pieces. Posted in Quilting. 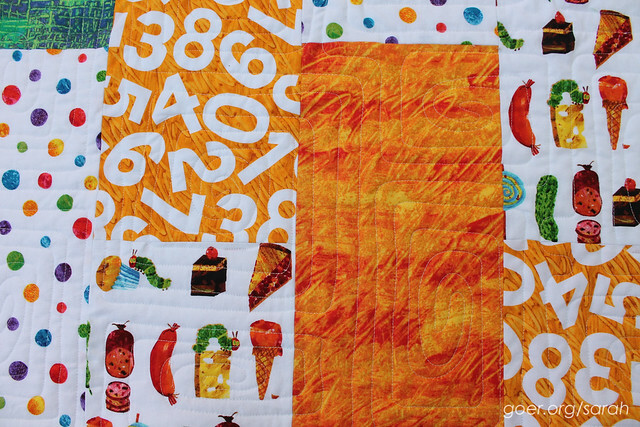 Tags: baby quilt, Caterpillar Fizz, fat quarter fizz, finished quilt, free motion quilting on October 3, 2016 by sarah. Love it!! Vibrant colors are perfect for a child!! And for adults too!! Well, for the length of time I'm taking to finish my son's twin sized version, I hope he's still loving it into adulthood! :-) Thanks, Bo! I do love color! I'll use it again for sure. 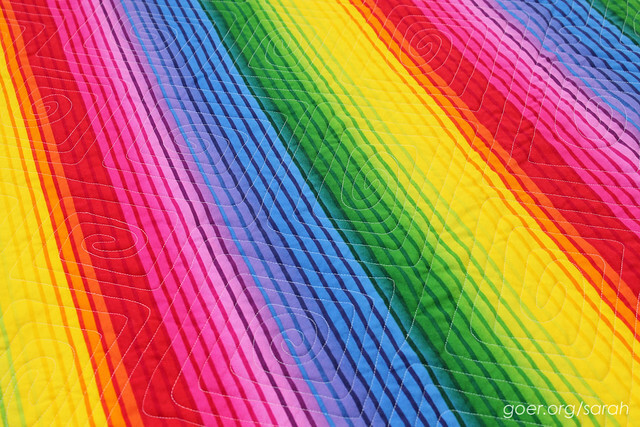 I'm 99% sure that it's my choice for my son's twin bed quilt, but I think his will have rainbow variegated thread. ;-) Thanks for visiting, Yvonne. This is so cute! 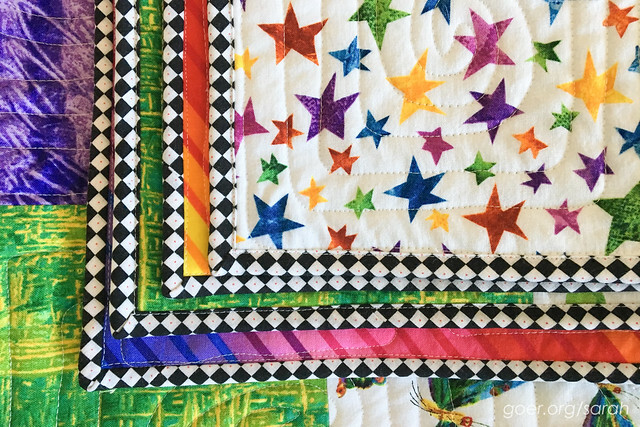 I love the bright backing and how you quilted it. It's adorable! 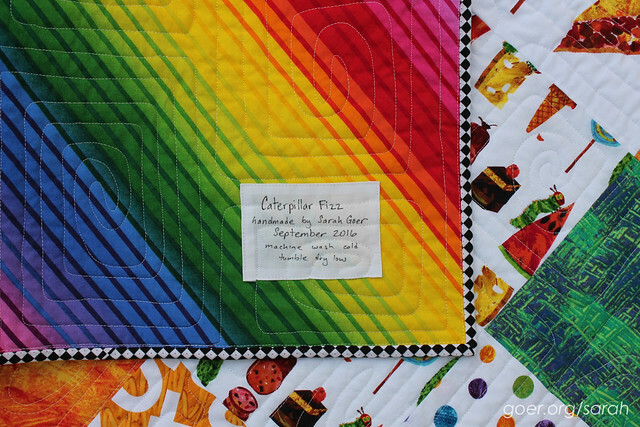 And I love that quilting too! It's wonderful! Congratulations on your finish, and thank you, on behalf of the 2016 global FAL hosts, for taking part! I like that quilting motif. And that black and white binding...it's amazing. Thank you so much! I'll be using the same quilting motif on my twin sized version of this for his bed. Oh, but he's already asked for variegated Not sure yet what I'll bind it in, but the backing fabric is just blue, so there are many possibilities. 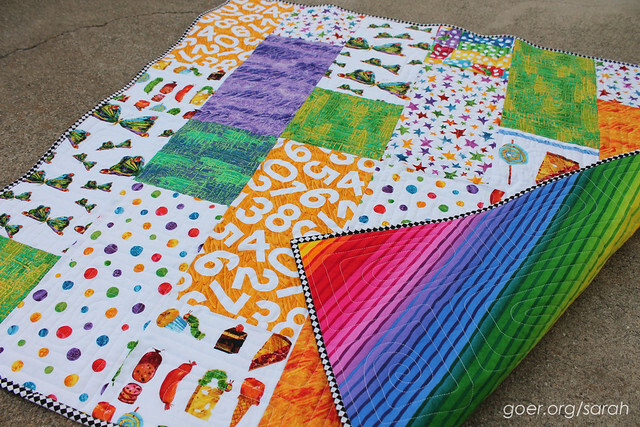 Well isn't that a fun little quilt! It's a great example of letting a fabulous fabric line do all the work (not to discount the cutting and stitching *you* contributed, of course). Absolutely! Sometimes it's great to sew together some fabric in fast, simple design! Thank you for visiting, Alla! I love everything about this one! Especially that fabulous fabric you used on the back and that quilting!